Revision ACL surgery may be complicated by tunnel malposition and/or tunnel widening and often requires a staged treatment approach that includes bone grafting, a period of several months to allow bone graft incorporation and then definitive revision ACL reconstruction. The purpose of this study was to evaluate the results of a single-staged ACL revision reconstruction technique using a cylindrical dowel bone graft for patients who have existing posteriorly placed and/or widened tibial tunnels in the tibia at a minimum of 2 years follow-up. 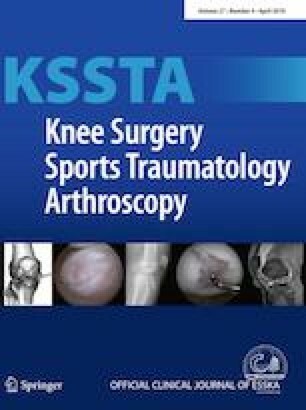 Between 2010 and 2014, patients undergoing single-stage revision ACL reconstruction with the described technique were prospectively enrolled and evaluated. At a minimum of 24 months, patients were evaluated by physical examination, multiple clinical outcome instruments including KOOS, Tegner and Lysholm, and preoperative and postoperative MRIs. At a mean of 35.1 months, 18 consecutive patients had no revision surgery and no subjective knee instability. There were statistically significant improvements in the Tegner (median 2, interquartile range 2.25; p < 0.01), Lysholm (20.0 ± 15.0; p < 0.01), KOOS symptoms scale (12.9 ± 11.8; p < 0.01), KOOS pain scale (15.4 ± 18.7; p < 0.01), KOOS ADL scale (13.5 ± 19.0; p < 0.01), KOOS sports scale (32.8 ± 26.4; p < 0.01), and KOOS QoL scale (18.1 ± 16.9; p < 0.01). Postoperative MRI demonstrated statistically significant anteriorization of the tibial tunnel and a statistically significant decrease in tunnel widening. Revision ACL reconstruction utilizing a single-staged tibial tunnel grafting technique resulted in improved knee pain, function, and stability at a minimum of 24-month follow-up. The online version of this article ( https://doi.org/10.1007/s00167-019-05467-6) contains supplementary material, which is available to authorized users. No funding was necessary for the completion of this study. The authors report no conflicts of interest related to this article. IRB approval and informed consent was obtained for this investigation.